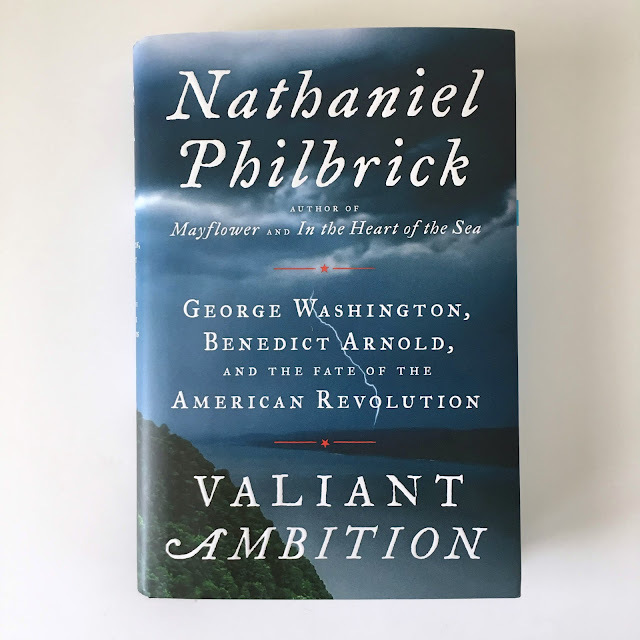 Nathaniel Philbrick's newest book, Valiant Ambition: George Washington, Benedict Arnold, and the Fate of the American Revolution, is truly a fantastically well-written and researched text on two of the key figures within America's founding--its greatest hero and its greatest traitor. I've previously admired Philbrick's gift for reporting history when I read his nonfiction account In the Heart of the Sea which tells of the sinking of the whaleship Essex and the subsequent fight for survival among its crew (read my review here). When I heard about his latest publication, I knew I wanted to read it. Having spent time living near some of the American Revolution historic sites, I had some introductory knowledge about George Washington. On numerous occasions I'd visited Philadelphia, seen the Liberty Bell, toured Independence Hall, and spent much time at Valley Forge. I didn't, however, feel I knew much about Benedict Arnold aside from the fact that he is considered the ultimate traitor. Philbrick's book taught me so much more about both of these men. Beyond a basic history lesson, Philbrick tells the tale in such a way that I truly could envision both Washington and Arnold as real, complicated figures who played crucial roles in the founding of our country. As depicted in Valiant Ambition, George Washington was a man who grew into a hero: while he possessed a natural gift for leadership and hard work, he was dedicated to the cause, tireless in his commitment to learn from mistakes, and is rightly portrayed as the admirable Father of our Country and Commander-in-Chief that his is envisioned to be. 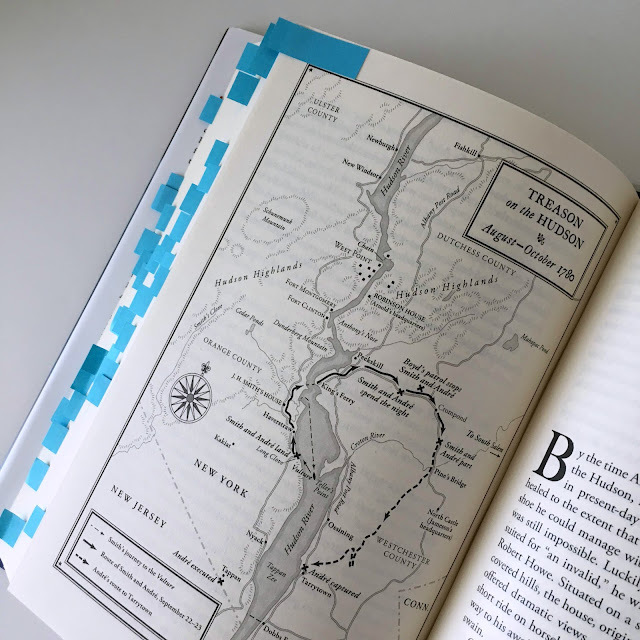 Philbrick details Washington's battles, his victories and his defeats, his historic crossing of the Delaware, the terrible winter conditions, the battle of Valley Forge, and his ultimate triumphs. Amid these scenes, however, was his longtime trust in a man named Benedict Arnold until treason came between them. I enjoyed reading about Washington and learning more details about things I'd never known before, including his amazing skills as a horseman. The greatest takeaway from the book is, of course, its intriguing portrayal of Benedict Arnold, the man who would commit treason. Arnold was not a low-level soldier who one day made the rash decision to sell his country. Instead--and what makes for Philbrick's fascinating study--is how Arnold was first a hero who then made the purposeful decision to sell West Point to the British and betray his country for money and infamy. Philbrick's depiction of Arnold is fascinating. Arnold was recklessly brave, a quality which enabled him to lead soldiers to victory but often at great risk. 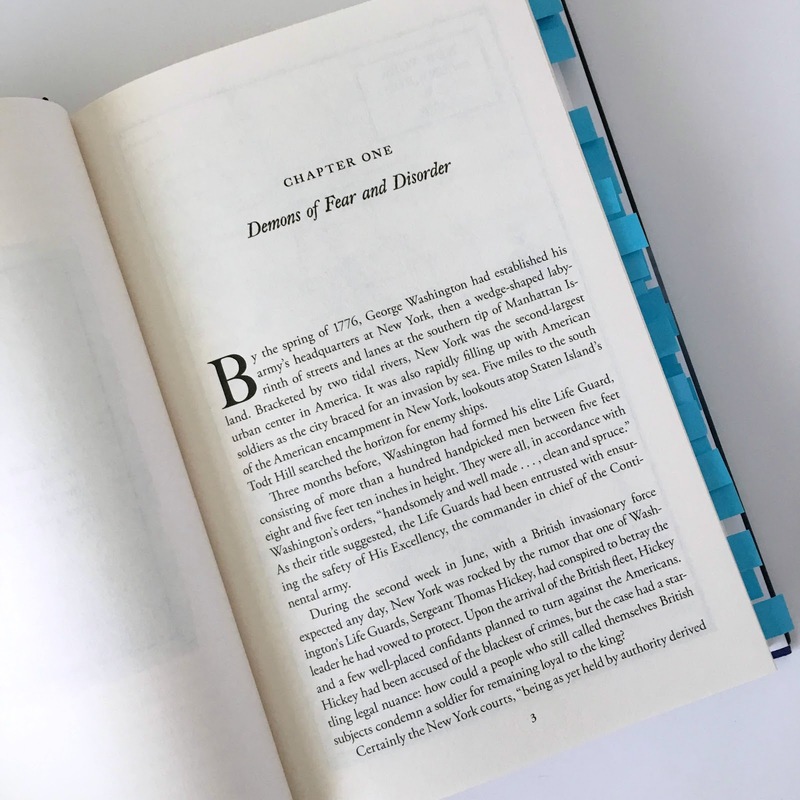 His motivations in great part seem to stem from his desire for honor, power, and recognition: he was both charming but thoughtless, brave but risky, successful yet cruel. He was not in any way traitorous from the start and did much to help the American Revolution in numerous battles. The wedge that became an ever-growing divide between the once hero and the soon-to-be villain was his desire for much-deserved recognition and Congress' refusal to bestow it. In 1776 on Lake Champlain, Arnold led a fleet to victory against great odds. One year later in the Battle of Saratoga, Arnold suffered a leg injury that would debilitate him for the rest of his life. During the period between these historic events, Arnold's desire for a promotion from Congress failed and his lack of seniority on the battle field festered within him. Though he would continue the fight for a promotion in rank to general and would likewise continue to be trusted George Washington, his personal financial failures--much of which he sacrificed for the war effort--and his lack of public recognition weighed on him. He attempted to resign but was denied and was repeatedly entrusted with greater responsibilities, including a position as military general of Philadelphia, a city in great disarray and in need of leadership. Philbrick highlights Arnold's courtship and eventual marriage to Peggy Shippen as a key element of his eventual act of treason. Peggy, a volatile yet beautiful young woman, fed and fostered Arnold's growing resentment. With her encouragement, he began communicating with the British and offered his treason in exchange for power and wealth. 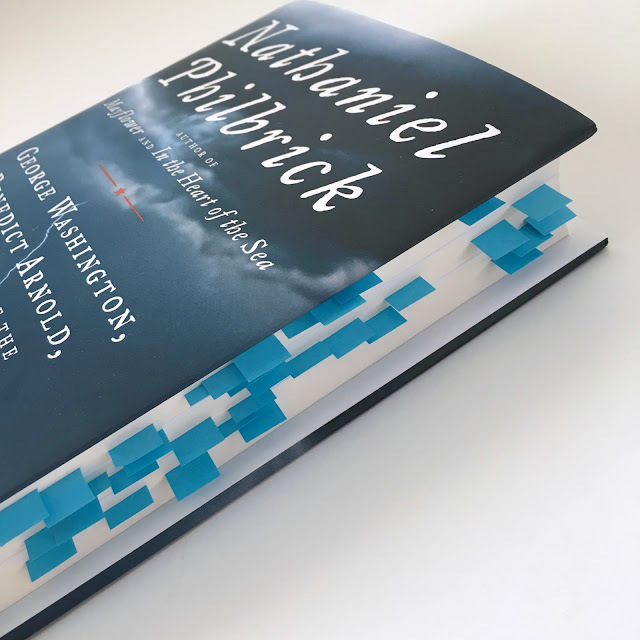 Philbrick tracks their coded letters, includes printed copies within the text, and details Arnold's choice to betray not only his friend George Washington and his fellow military soldiers but an entire country, all for money. What shocked me most of all was that after Arnold betrays the U.S. and surrenders West Point to the British, he evades punishment. While his accomplice Major John André confesses and suffers public execution by hanging, Arnold leaves New York and moves to England and dies decades later. If you are at all interested in U.S. history, the American Revolution, or the historic account of the greatest act of treason in U.S. history, I wholeheartedly recommend reading Valiant Ambition. The text is replete with meticulous research, fascinating real-life characters, maps, historic documents, photographs, and presents a great case study of both George Washington and Benedict Arnold's role in the American Revolution.